Connor and I took our first trip with the new trailer last weekend, to a lesson with NK and then to his breeder's for a couple days of fun. We are both so in love with this trailer, it's completely changed the way I feel about hauling. 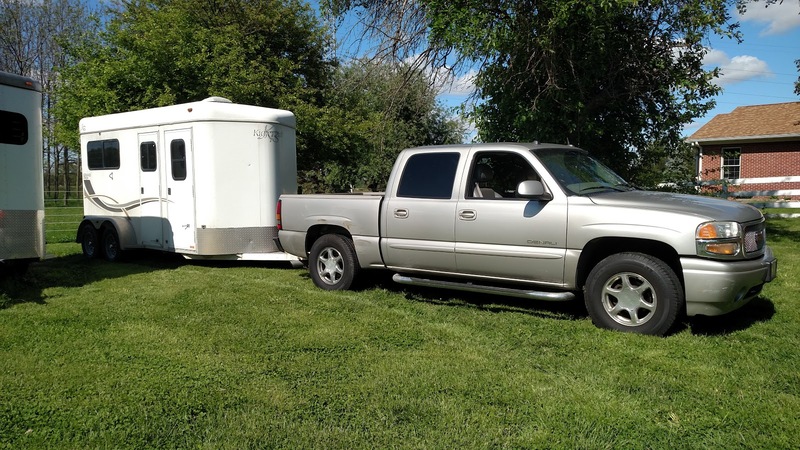 On paper, my old trailer with one pony in it was fine for my truck, a 2005 GMC Sierra Denali with a 6.0L V8 and every available option. And I did haul with it for two years without feeling unsafe. I know there are others out there towing more trailer with less truck. But I cannot overstate how much safer it is, how much easier to handle, and how much better for Connor it is that I now have 1,400 fewer pounds behind me. If I was adequately trucked before, I'm overtrucked now, and guys, it is SO much safer. 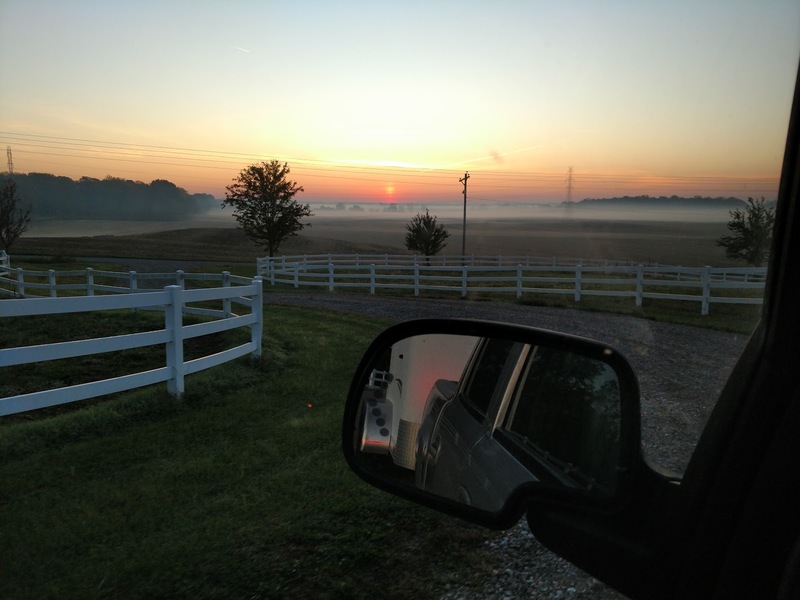 It was a beautiful morning as I was leaving the farm on Friday, but also, I can practically see the back door of my trailer with non-towing mirrors now. With the KB, I had to plan ahead for stoplights especially on the 55mph state highway we travel regularly, because I needed more time than the yellow light afforded me to stop gracefully enough not to jostle Connor. I was very much reliant on the trailer's brakes to stop it, and Connor felt that. 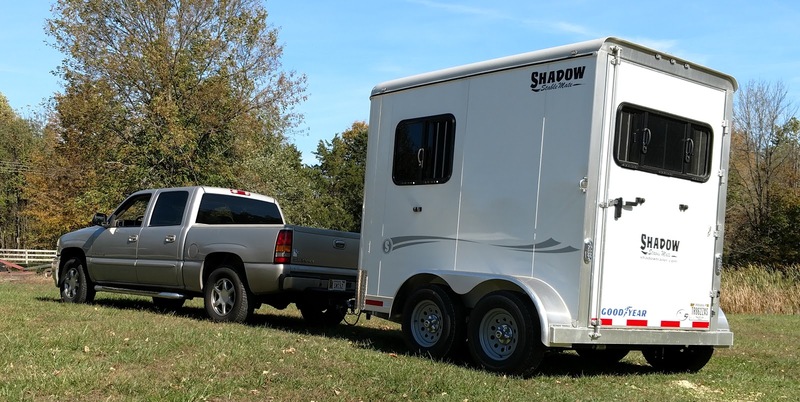 With the Shadow, I can brake normally, (even loaded it feels like I'm just driving the truck without the trailer), and stop gently within a yellow light from 55mph, no problem for either me or the horse. The Shadow exerts a lot less tongue pressure on the truck (you can see how much less the truck squats with the Shadow in the photos above), is shorter, and is lighter, all of which make day to day towing easier, but also could be the difference between a wreck and avoiding a wreck if I ever find myself in a less-than-ideal towing situation. Most importantly, Connor is the happiest in the trailer I've seen him in years. 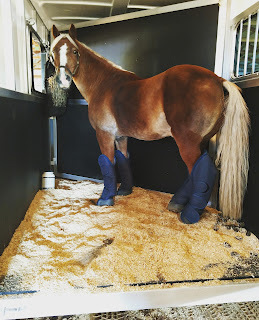 He actually ate hay on every leg of our trip, something he never once did in the KB. Further proof he's happy: In the KB I had to unload him with a Dressage whip because he'd shoot backwards the second I opened a door. When I open the Shadow's door, he stands there contentedly staring at me with a leg cocked, in no hurry to get off. It's so shiny, I kept finding myself getting freaked out by the reflections off the nose during my first nighttime haul. I'm not trying to call out anyone hauling a bigger trailer with a half ton like I was before. It WAS adequate in normal driving conditions. Getting a rig at all is expensive and hard, and getting the kind of truck to trailer ratio you get with a half ton/1H trailer either requires downsizing the trailer or buying a bigger truck - and trucks are so stupidly expensive! But I hope everyone can get to a point where they're overtrucked when they haul someday. It's hard to get a frame of reference for hauling when most of us ammies haven't gotten the chance to drive many different rigs, but now that I know how hauling this one feels, I think if I had the KB back I'd get a 3/4 ton. 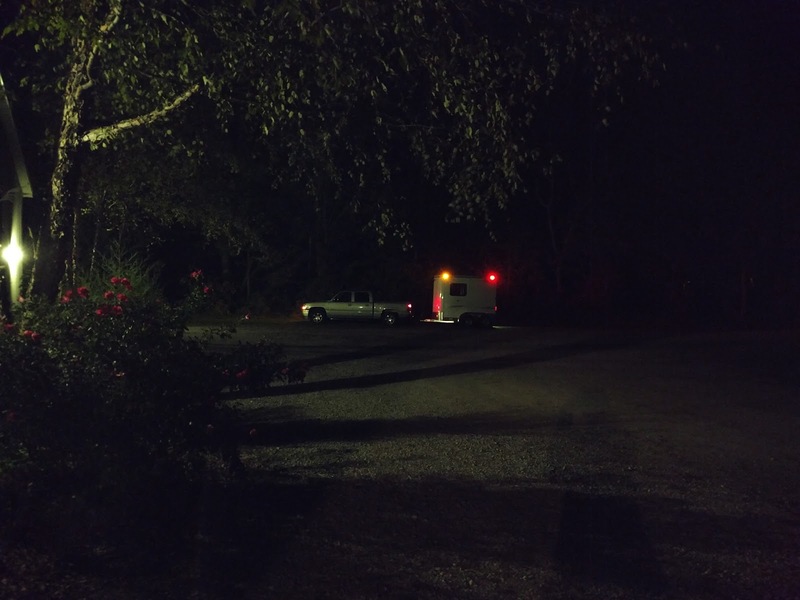 Any other haulers have a "heavens opened up and angels sang" revelation like this? Omg yes!!! I switched from a gas truck to a diesel and it was like the heavens opened up and sang!!!! (Not sure about all the specs. I'm pretty sure they were almost the same except for the fuel type and stopping was not my issue) When I was on flatter ground it wasn't as big of a deal but when I moved to the foothills I struggled up hills and watched my gas gage fall quickly. 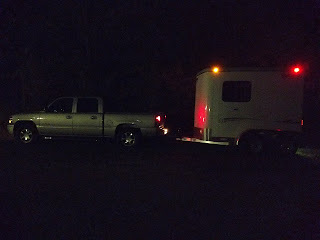 The first day I hauled with my diesel truck I was so excited to not have to speed down hills just to gain enough momentum to get up the next :) I love my trailer (extra tall extra wide 2horse gooseneck with tack room) and needed the size for Chimi so the truck had to be updated for me. Best decision ever!!! That's awesome! And that's exactly what I felt too! I mostly haul short distances on flat ground, but was always cautious on hills. So glad you got the bigger truck! Yes- I have done this too. I love how easy it is to haul now with my current combination. So glad you got the new trailer. Peace of mind is definitely worth it. Word. So is a happy horse. When I get to the point where I can buy a truck again, def going to get as much truck as I can afford! I would feel so much safer being overtrucked! For sure! I hope you get there in the near future, your running up and down I-65 over and over every show is crazy! I've had a similar experience. I've had the same trailer for many years but my dad just bought a new truck. Went from a gas 1998 F250 to a 2016 dodge eco-diesel. Even though the old truck was a 3/4 ton and the new is a 1/2 ton it hauls significantly better. More power and it stops much more easily. It's lovely and a great feeling when you have your most precious possession being pulled along behind you. A newer, bigger truck was on my list for this year, but it got pushed back for other things and I never really ended up hauling much this year anyway. Hopefully next year though! My trailer isn't super heavy, but I want something bigger and better to haul it with so badly! I feel a wee bit over-trailered with the Tahoe when trailering two horses (2013, 5.5L V8 with full towing package). Stopping seems fine, it's the hills that are hard. I would most definitely never take this rig into the mountains, but for around town I feel perfectly comfortable. Trucks are just so damn expensive, but safety is of course, priority. and then there are those people who haul with an SUV ...scary. So glad you have a rig set up you feel safe in now. There is NOTHING worse than hauling and being stressed! I used to haul a 2400# empty-weight 2 horse bumper pull with my 2001 4Runner; I hauled one horse who weighed in at 950# - it's less weight than our boat that the 4Runner used to haul. It worked, but I had to plan every second of my drive and also plan to go much slower in our mountains. Committing to going the speeds I did, I never felt unsafe and on paper everything did check out.